The Welsh language is about 1500 years old. Welsh evolved about the sixth century AD from Brythonic – a language that people spoke across Britain. Over its 1500 years of existence it has continued to evolve, its use as a daily language and the language of administration has waxed and waned and waxed again as it has struggled to coexist side by side with one of the world’s major languages – English. Some have been predicting the demise of the Welsh language for many a long year, others have wished to see it disappear off the face of the earth, while others have striven to ensure its survival. Against all odds and through storms and oppression, the Welsh language has survived and evolved and is, in the words of singer Dafydd Iwan, “yma o hyd” – still here. Early Welsh (c.550 – 800) and Old Welsh (800 – 1100) are the names given to the period in the language’s history between the sixth century and beginning of the twelfth century. Welsh was an everyday language and the language of poetry, prose and administration. Examples of written Welsh from this period can be seen in Latin manuscripts such as the ‘Book of St Chad’ or in later manuscripts such as ‘The Book of Llandaff’ which are copies of earlier ones. The earliest example of a complete text in Welsh can be seen on a gravestone in St Cadfan’s church, Tywyn in Gwynedd. The Celtic Church played an important part in the recording and copying of Welsh texts. The profusion of place names linked to a church and its patron saint (e.g Llandeilo = the church of Teilo) reflect the link between Christianity, the people and the language. Poets such as Aneirin, Taliesin, Llywarch Hen and Heledd composed poetry throughout this period, but this was an oral tradition; the written versions which we see today were written down during the next period. Story tellers also plied their craft, reciting and retelling stories such as those tales collectively called ‘The Mabinogion’; but the earliest written examples also come from the next period in the history of the language. Middle Welsh is the period between about 1000 and 1536. The period includes the golden age of the Welsh princes where Welsh was a language of administration and everyday use and the period of the Gentry – the period after Llywelyn ap Gruffudd was killed by the English in 1282. The laws of Wales are known as ‘Cyfraith Hywel’ – the Laws of Hywel Dda. Hywel ap Cadell – King of Wales (942-950) – was the man who gathered together the Welsh laws of the 10th century. The earliest copy we have is in a 13th century manuscript, called Peniarth MS 28. This is also the time when manuscripts containing the White Book of Rhydderch, The Red Book of Hergest and The Black book of Carmarthen were written; it is in these books that we find recorded the work of earlier poets and the tales and legends collectively known as The Mabinogion. In Welsh poetry, this was the time of the Poets of the Princes – poets such as Cynddelw Brydydd Mawr (fl. 1155 – 1195) and Gruffudd ab yr Ynad Coch (fl. 1277 – 1282) – and the Poets of the Gentry – people such as Dafydd ap Gwilym (c.1315 –1370) and Iolo Goch (c.1325 – 1398). As in the earlier period, the language was influenced by the Christian Church and the religious orders of the time, especially the Sistercian abbeys, played an important part in recording and copying the poetry and prose of the period. The modern period lasted from about 1536 till the mid twentieth century. In 1536 and 1542 Henry VIII, King of England, passed laws making Wales part of England and the Welsh language lost its official status as a language of administration. From this time onwards the leaders of Welsh society – the gentry – started to become more English in language and outlook. The ordinary people kept hold of their language till the middle of the nineteenth century. In 1588 the Bible – known as William Morgan’s Bible – was published in Welsh for the first time and the language of the Bible set the gold standard for written Welsh until the twentieth century. The influence of Christianity, and especially the nonconformist churches – was an important factor in ensuring that Welsh survived as a living language. The Welsh started to become literate in the 19th century; from 1870 children aged 5-10 had to attend school. Howver, for most of the 19th century, Welsh was not part of the school curriculum. Indeed, some schools used a system known as the ‘Welsh Not’ to discourage children from speaking the language in school. For schools, and for many parents too, English was the language of advancement in the world. English was the language of work, business and administration; it also was the language of the great British Empire. So, although, may people continued to speak Welsh outside school, they were not taught to read and write the language, unless they were members of Welsh chapels and churches or belonged to youth groups such as the Urdd. The National Eisteddfod and very many smaller eisteddfodau helped to keep the Welsh language and its culture alive. 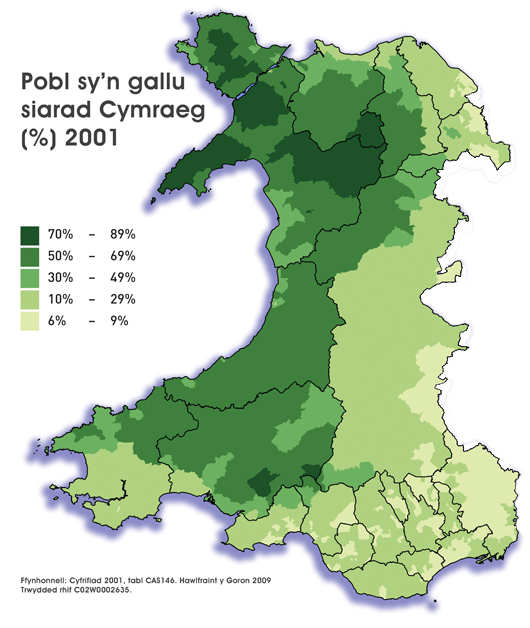 From about 1960 onwards, although the numbers of people speaking Welsh continued to fall, the growth of Welsh national consciousness and the rise of a Welsh speaking middle class helped to keep the language alive. People were beginning to ask for public services through the medium of Welsh, for Welsh on roads and public places and for more Welsh language television and radio programmes. Welsh was also being taught in schools both as first and second language, and the demand for Welsh medium education was beginning to grow, especially in those areas which had become anglicised. The growth of BBC Radio Cymru since the 1970s and S4C – the Welsh Language Television Channel – since the 1980s has helped to raise the status of the language. Today there is an increasing interest in Welsh among people of all ages and thousands of people are learning the language. The Welsh language can be seen and heard more widely in the everyday life of the people of Wales and especially in the fields of education, in the media and in public life. In 2011 a law was passed giving the Welsh language an official status in Wales alongside English. The Welsh that is spoken and written has changed greatly over the last 1500 years. At one time, Wales was a country of many and varied dialects; today, dialectic words and phrases continue to give the language its hues and tones and people use northern or southern language patterns when speaking. English words and terms continue to influence the language as they do other languages. Modern technology has broken down the linguistic barriers that at one time created a barrier to understanding and the young, as in other cultures, are bending the language to their own idiom. As communication technology develops, the Welsh language will have to evolve to make itself fit for life in the twenty first century.